Any quantity only $1.99 per coin over spot! The Austrian Philharmonic Coin debuted in 1989 from the Austrian Mint. As the official coin of the nation of Austria, the Philharmonic was made available first in gold, then in silver, and most recently as a platinum coin. 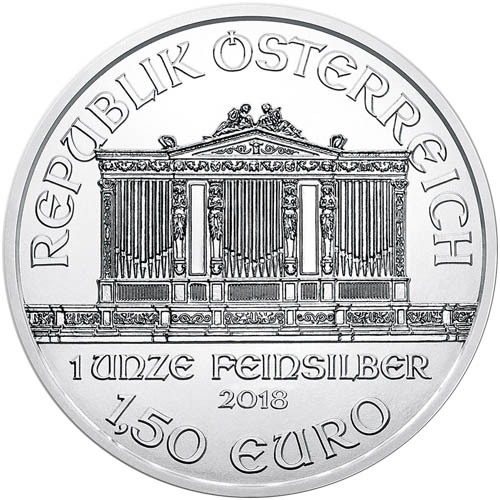 The 2018 1 oz Silver Austrian Philharmonic Coin is available to you today for purchase online at Silver.com. Ships to you sealed in protective plastic flips, mint tubes of 20 coins, or Monster boxes of 500 coins. Eleventh release of the Silver Austrian Philharmonic coin! Obverse bears the design of the Great Organ from the Golden Hall. Reverse includes a cluster of musical instruments from the Vienna Philharmonic orchestra. In 1989, Thomas Pesendorfer designed the obverse and reverse images used on the Austrian Philharmonic Coin. Pesendorfer is the Chief Engraver of the Austrian Mint, and developed images reflective of the Vienna Philharmonic Orchestra and its role in Austrian society for more than 170 years. The Gold Philharmonic coin debuted in 1989 with two weights, and grew by 2014 to include five weights. The Silver Philharmonic coin debuted in 2008 featuring the same designs from the gold coins in the series. The most recent addition to the collection was the Platinum Philharmonic, which debuted in 2016. On the obverse of all 2018 1 oz Silver Austrian Philharmonic Coins you’ll find the image of the Great Organ, a massive organ located within the Musikverein Golden Hall. Located in the Innere Stadt borough of Vienna, the Golden Hall is the orchestra center where the Vienna Philharmonic Orchestra performs. 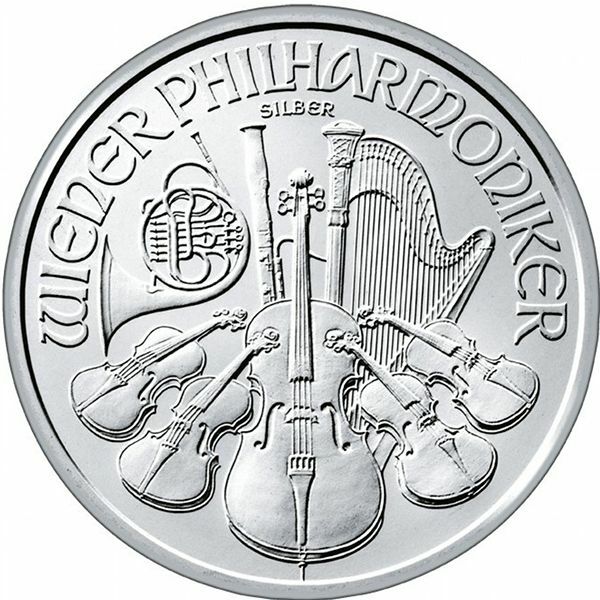 The reverse of all Silver Austrian Philharmonic Coins includes a collection of musical instruments. While not representative of every instrument used by members of the orchestra, it does include major pieces such as the harp, violin, cello, bassoon, flute, and French horn. The engravings on the Silver Austrian Philharmonic coin are listed in both English and German, the official language of Austria. Your 2018 1 oz Silver Austrian Philharmonic Coin is available for purchase in BU condition. Coins in BU condition have no signs of wear and tear, though minor flaws such as breaks in the luster, spotted surfaces, and contact marks are possible as a result of the production processes at the mint. The Austrian Mint is the official sovereign mint of the nation. Opened in 1194 by Duke Leopold V, the mint has been the official coining facility of the nation for centuries and now produces Austrian Euro coins. We encourage customers to contact Silver.com with questions. We’re available on the phone at 888-989-7223, online through our live chat, and via our email address.